Combine the mashed potatoes, green capsicum (bell peppers), coriander leaves, garlic and onion paste, cornflour, green chillies, powdered sugar, dry celery and salt, in a bowl, mix with your hands to make an even mixture. 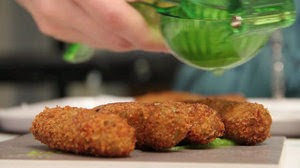 Make even cylindrical kababs out of the mixture, dip them in some Worcestershire sauce and roll into bread crumbs. Deep fry in medium hot oil until golden brown. Garnish with a few coriander leaves and lime juice. Serve hot with some coriander chutney.